A range of issues, including ways to deepen cooperation in various areas, were discussed by Mr Lukashenko and PM Modi during their talks. New Delhi: Prime Minister Narendra Modi today held extensive talks with Belarus President AG Lukashenko to ramp up bilateral engagement in various areas, including defence, trade and investment. 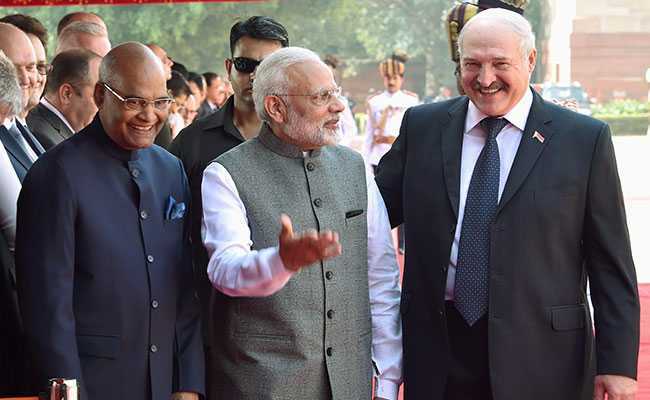 The Belarus President's visit takes place at a time when Belarus and India are celebrating the 25th anniversary of the establishment of diplomatic relations. Vice President Venkaiah Naidu and External Affairs Minister Sushma Swaraj called on the president of Belarus before his talks with PM Modi. Mr Lukashenko, who arrived in Delhi last night, was also given a ceremonial welcome at forecourt of the Rashtrapati Bhavan this morning.